Special features include new “3D Washboard and slit” siping on the centre rib for extra grip and block stiffness, high edge density in the centre area for maximum bite on hard-packed snow and ice, and continuous Z-shape lugs which enhance edge effect and snow shear force in all driving directions. 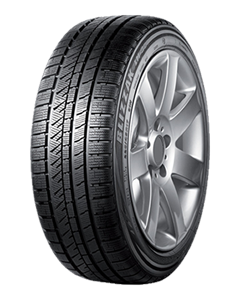 Bridgestone has also made the new BLIZZAK LM-30 more environment-friendly and economical, compared to the BLIZZAK LM-20 it replaces. By reducing rolling resistance by up to 16% through weight loss resulting from the optimization of the carcass shape and belt package, fuel consumption has been cut by up to 2.5% and CO2 emissions reduced by up to 4.5 g/km. The BLIZZAK LM-30 also reduces pass-by noise by more than 1dB and in-car noise by 2dB. Sorry, we currently do not have any tyres with the Blizzak LM30 pattern in stock.